WHEELS, 20" X 9" (50.8 CM X 22.9 CM) CHROME, TRANSMISSION, 6-SPEED AUTOMATIC, ELECTRONICALLY CONTROLLED with overdrive and tow/haul mode (STD), TRANSFER CASE, ACTIVE, 2-SPEED ELECTRONIC AUTOTRAC with rotary controls, includes neutral position for dinghy towing, TRAILER BRAKE CONTROLLER, INTEGRATED, TIRES, P275/55R20 ALL-SEASON, BLACKWALL (STD), SUNROOF, POWER, TILT-SLIDING with express-open and close and wind deflector, SUN, ENTERTAINMENT AND DESTINATIONS PACKAGE, (CF5) power sunroof, (U42) rear seat DVD entertainment system and (IO6) Chevrolet MyLink radio with navigation, SEATING, FRONT BUCKET WITH PERFORATED LEATHER-APPOINTED HEATED AND COOLED SEAT CUSHIONS 12-way power driver and passenger seat includes 6-way power cushions, driver seat 2-position memory, 4-way power lumbar control and power recline (STD), REAR AXLE, 3.42 RATIO, PAINT SCHEME, SOLID APPLICATION. 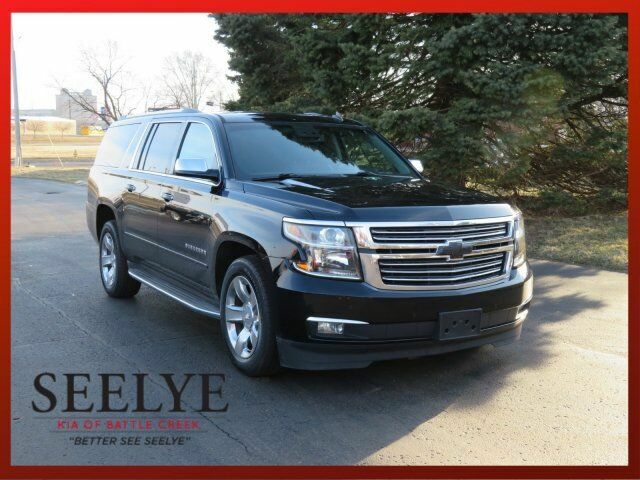 This Chevrolet Suburban has a strong Gas/Ethanol V8 5.3L/ engine powering this Automatic transmission. MAX TRAILERING PACKAGE (Includes (GU6) 3.42 rear axle ratio and (JL1) Trailer brake controller. 4WD models also include (NQH) 2-speed active Transfer case. ), LICENSE PLATE FRONT MOUNTING PACKAGE , LIFTGATE, POWER, JET BLACK, PERFORATED LEATHER-APPOINTED SEAT TRIM, ENTERTAINMENT SYSTEM, REAR SEAT, BLU-RAY/DVD with remote control, overhead display, four 2-channel wireless infrared headphones and auxiliary audio/video input jacks/SD and USB slots, includes second screen for third row passengers, ENGINE, 5.3L V8 ECOTEC3 WITH ACTIVE FUEL MANAGEMENT, DIRECT INJECTION AND VARIABLE VALVE TIMING includes aluminum block construction (355 hp [265 kW] @ 5600 rpm, 383 lb-ft of torque [518 N-m] @ 4100 rpm) (STD), DVD SCREEN, THIRD ROW, BLACK, AUDIO SYSTEM, CHEVROLET MYLINK RADIO WITH NAVIGATION, AM/FM STEREO AND CD PLAYER 5 USB ports, 1 SD card reader and an auxiliary jack (STD), Wireless charging (Only on vehicles built after 10/5/14. Not compatible with all phones. Compliant batteries include QI and PMA technologies. Reference Mobile devices manual to confirm what type of battery it uses. ), Wipers, front intermittent, Rainsense, Wiper, rear intermittent with washer, Windows, power, all express down, front express up, Wheel, full-size spare, 17" (43.2 cm) steel, Warning tones headlamp on, key-in-ignition, driver and right-front passenger safety belt unfasten and turn signal on, Universal Home Remote includes garage door opener, programmable, Transmission, 6-speed automatic, electronically controlled with overdrive and tow/haul mode, Trailering equipment includes trailering hitch platform, 7-wire harness with independent fused trailering circuits mated to a 7-way sealed connector and 2" trailering receiver, Tires, P275/55R20 all-season, blackwall, Tire, spare P265/70R17 all-season, blackwall.